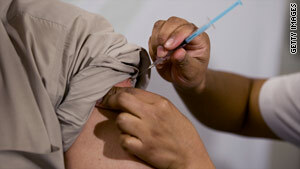 The CDC is encouraging more people to get vaccinated against the H1N1 virus. Washington (CNN) -- The H1N1 influenza virus is still circulating and causing illness, hospitalization and death, the Centers for Disease Control and Prevention said Thursday as officials made another call for vaccination. "Many people are still susceptible to this virus and would benefit from vaccination," said Dr. Anne Schuchat, director of the National Center for Immunization and Respiratory Diseases at the CDC. "We want to avoid complacency. We have a very good supply of the H1N1 vaccine all around the country." Schuchat estimated that at least 60 million Americans have received the H1N1 vaccine. She said 136 million doses are currently available for states to order and should be easily accessible through doctor's offices, local health departments, community and school clinics as well as pharmacies and retail centers. Four states -- Delaware, New Jersey, Maine and Virginia -- still report widespread H1N1 activity. Schuchat said that while the number of people getting sick is declining, officials are still seeing more activity than is usual for this time of year. And it's all H1N1, as seasonal flu strains have yet to emerge she said. According to the CDC, there was a slight increase in flu-like illness cases presenting at doctors offices and emergency rooms last week, and a rise in pneumonia and/or influenza deaths this past week. Expecting the virus to continue circulating for some time, Schuchat is urging doctors to "stay vigilant" by continuing to test patients with severe respiratory illness in an effort to prevent additional cases. But she stressed vaccination is still the best course of action. "I am concerned that people maybe complacent, that people may think this is all over. I would hate for people to make decisions thinking this is over and then get sick or severely ill," Schuchat said. Vaccinations provide a "chance for people to protect themselves and reduce the risk of serious complications. So I think complacency is probably our top enemy right now." The CDC is kicking off National Influenza Vaccine Week this weekend, a campaign designed to encourage more to get vaccinated, particularly those considered to be at high risk for complications -- pregnant women, adults with chronic complications like emphysema, seniors and children who have yet to be vaccinated. Schuchat said she doesn't know if the unusually cold temperatures sweeping the country will result in flu transmission, but vaccination will help reduce that risk. With the flu season fully underway, health officials say now is the time for children under the age of 9 to receive a second dose of the H1N1 vaccine. Health and Human Services Secretary Kathleen Sebelius visited Carlin Springs Elementary School in Arlington County, Virginia, Thursday, as more than 200 students lined up to receive a second round of the vaccine. She praised Arlington County officials for their school-based flu clinics. CNN's Padma Rama contributed to this report.